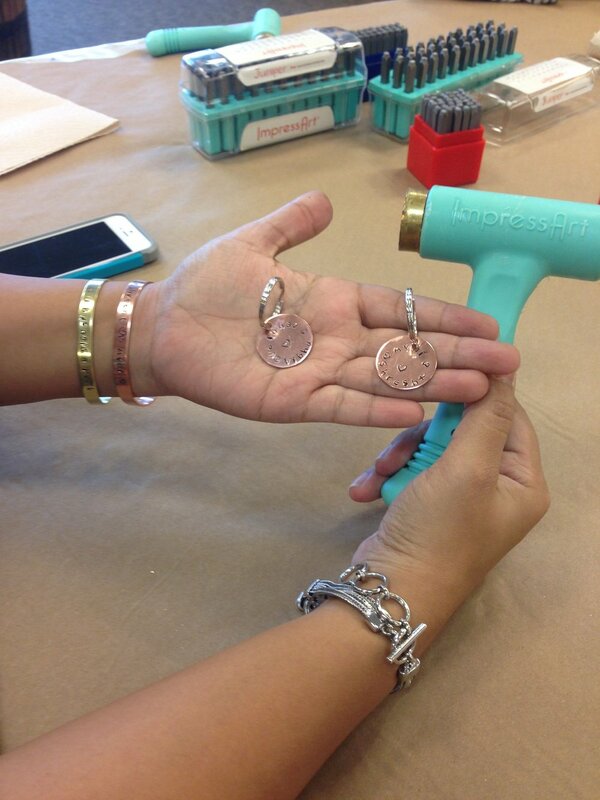 Our first hand-stamped jewelry class on September 26th at Pine + Pigment was a big success! Here are some photos of the projects our participants made during class. Please click here for more details on future hand-stamped jewelry classes. Have you seen on Instagram/ Facebook/wherever that “September is the new January”? Because of the typical school year cycle, September feels like a new beginning. It’s a chance to start fresh, create new routines, and get organized. As a wife, the mom of a very active nine-year-old, a full-time employee, and a handmade business owner, I have a lot of experience dealing with busy seasons. This particular season is no exception for us, and I wanted to share one of my favorite tricks for keeping things running smoothly when life feels crazy: Sunday prep. Taking a few hours on a Sunday to review your calendar and food prep for the upcoming week makes all the difference when it comes to feeling ready for the week ahead. If you have healthy eating goals, this makes a HUGE impact on whether you stay on track during the week or whether you’re eating take-out by Tuesday. Nothing makes me feel more like a rock-star than having my week planned and prepped by the time I go to bed on Sunday night. Here’s what I do and what works for my family – feel free to take what works for your situation, apply it your way, and ignore the rest. Side note - We are the furthest thing from perfect. We have weeks where we end up ordering take-out every night because we didn’t plan or prep over the weekend. Prepping makes life easier, but don’t beat yourself up if things don’t go as planned ('cause they rarely do). Food containers – No need to go out and buy all-new perfectly-matched containers, just gather enough for your first prep session. Don’t overthink this. Sharpie – Write on the outside of the food prep bags, especially if they’re going in the freezer. Make a list of go-to meals that most people in your family like (sometimes there’s no pleasing everyone). Post it on the fridge and refer back when you’re trying to figure out what to make during the week. Set a timer for 10 minutes and write down as many of your favorites as you can. Write appointments and events in your calendar for the upcoming week. Determine which nights you’ll cook at home, which nights you need a quick and easy meal, which nights you’re going out to eat, etc. Meal plan on Friday or Saturday with your schedule in mind - If you’re interested, comment below and I’ll make a separate list with links to our favorite weeknight meals. Start with a clean or semi-clean house if you can. Keep the bar for what counts as clean really low here. Notice I said clean, not spotless, not perfect, not immaculate. Let go of perfectionism, friends, just set a timer and then walk around the house and pick up and put away as much as you can during the time you’ve allotted. Wipe down counters and surfaces. Go through that stack of mail. Enlist your spouse and kids. Put on some music and just get it done. Do the dishes and empty the dishwasher first. This helps make food prep clean-up go SO much faster, especially when you’re tired at the end of your prep session and ready to be done. You can just rinse off the dishes you used for prep and put them straight in the dishwasher. Grocery shop – To be totally transparent, I rarely grocery shop myself. Either I’m the list maker and my husband goes to the store or we order from Shipt and have the groceries delivered. It’s worth it for us. Seriously, if you’re slammed and you feel like you have zero time to shop – outsource what you can. We actually spend less using Shipt because we have more time to prep food and therefore don’t eat out as much, and having someone buy from a list means no more impulse purchases. The best part is that our frequently purchased foods are in a list so we can reorder even faster the next weekend. You can follow this link to save $50 on an annual membership. Figure out what food you can easily prep ahead of time and write out your plan of action. Think about what needs to be washed, what needs to be chopped, what needs to be roasted, what needs to be sautéed, what needs to simmer. Group like tasks together and plan to do them in an order that makes sense and uses the least amount of dishes. Again, don’t spend 2 hours on this. Spend 5 or 10 minutes, tops. SANITY SAVER: Avoid the Pinterest rabbit-hole. I have wasted DAYS on Pinterest (I heart you, Pinterest, but seriously, stop wasting my prep time) looking for new recipes. Do yourself a favor and don’t try to reinvent the wheel every night. If anything, pick one or maybe two new recipes to cook (only if you want to AND you have extra time during the week for experimental cooking). Stick to tried and true meals that you know by heart the rest of the time. Sunday – I plan a dinner that may take longer to make (because I usually have time to cook on Sunday nights) and has leftovers. Think lasagna, roast chicken, soup, a casserole, or chili. Monday – My son has soccer practice and I go to the gym on Mondays, so we usually eat the leftovers from Sunday. Plus you’ll want a break from cooking after your Sunday prep. Tuesday – I usually work on jewelry orders, but I have a little more flexibility, so I try to plan another meal that will have leftovers that doesn’t take too long to throw together. My husband will generally cook on Tuesdays. Think pasta, easy chili recipes, etc. Wednesday – Soccer practice and gym. We’re eating leftovers. Thursday - Another jewelry order night, so we’ll probably have something quick. Think take-out or maybe fajitas, tacos, a stir-fry, or salmon. Friday – Typically we have pizza on Fridays. We love making grilled pizza in the summer or we’ll order one. Saturday – Usually we like to go-out or grill on Saturday nights. See? Not so hard. Write out your schedule first, then meal plan around your time. Don’t meal plan first and then realize you have a PTA meeting on the night you bought all the ingredients for a brand new recipe, but you don’t have time to make it. What you actually do during prep time depends 100% on which recipes you chose for the week. Let's get started! Gather your kitchen supplies: cutting boards, knives, a sieve, pots, pans, bowls, a cheese grater, whatever you need for your recipes. Mise en place ((French pronunciation: [mi zɑ̃ ˈplas]) is a French culinary phrase which means "putting in place" or "everything in its place." – source: Google): In other words, set everything up. Get the spices you’re going to use out of the pantry and put them next to the ground turkey that you’re going to brown. Put your knife next to your cutting board. Grab your food containers. You get the idea. Turn on your music or podcast. Prep tonight’s dinner first (so that it’s ready to go and you don’t resort to take-out at the end when you’re tired – which I’ve totally done! ), heat it last, unless it needs to cook for a long period of time. Cook things that take the longest first. Again, duh, but the more you can work on other things, like washing strawberries while your chicken roasts, the faster you will finish. Use your other appliances, i.e. it still counts if you microwave the sweet potatoes. You don’t have to do everything the hard way. Think Rice cooker, Instapot (I don’t have one, but I’ve heard good things), the toaster oven, the grill, a crock-pot, etc. It also still counts if you use frozen veggies. Accept that the kitchen you just cleaned is going to get messy again. Make it easier on yourself by rinsing dishes as you go and by reusing the pots and pans as much as you can. Sunday – Roasted Chicken with roasted sweet potatoes and broccoli. I would start by roasting the chicken. While the chicken is cooking I would wash and chop the broccoli and sweet potatoes. When about 30-45 minutes is left on the cooking time for the chicken, I would put the sweet potatoes and broccoli in the oven to roast. Monday – Leftover roasted chicken in wraps with lettuce and other veggies. Chop the veggies. Make any dressings. Cut up fruit and veggies for lunches for the week. Tuesday – Buffalo Turkey chili. The recipe I use for this is really simple, so unless I was feeling extra productive, I probably wouldn’t prep anything for this. Thursday – Salmon and broccoli. Wash the broccoli, put a reminder in my calendar to thaw the Salmon on Wednesday night. Friday – Chicken fajitas. I would chop the peppers and onions and possibly grate a little cheese. Doing this amount of Sunday prep would not take more than 1 hour of hands-on time in the kitchen (not including the time the chicken is in the oven), yet I’ve saved myself tons of time during the week by batching my tasks. Once I finished food prep, if I wanted to feel even more like a rock star, I would finish the laundry, lay out my clothes for the week, have my son lay out his clothes, create my task list for the week, and then finish the day with on the patio with a good book (and possibly wine). What questions do you have about Sunday prep? Do you use Sundays as a prep day? To stay up-to-date on all things, Maggie Claire Designs, click here. I adore Rachel Hollis and this video makes me love her that much more. If you’re a mama, go watch! Sharp Objects on HBO. The finale is Sunday and I’m psyched. Speaking of Rachel Hollis, I finished Girl, Wash Your Face earlier this summer and I highly recommend it. I’m rereading Harry Potter this summer (how has it been 20 years since this series came out?) and I’ve made it to Deathly Hallows. Please bring me some tissues! Guess who's back, back again. Leather bracelets are back, tell a friend (if you're humming Eminem right now, we are officially besties). Not that they ever left in my mind, but since cooler temperatures are in sight, everyone seems to be getting ready for Fall. I’m gearing up for my first stamping class on September 16th at Pine + Pigment. If you want to come, I'd love to see you! Click here for details. 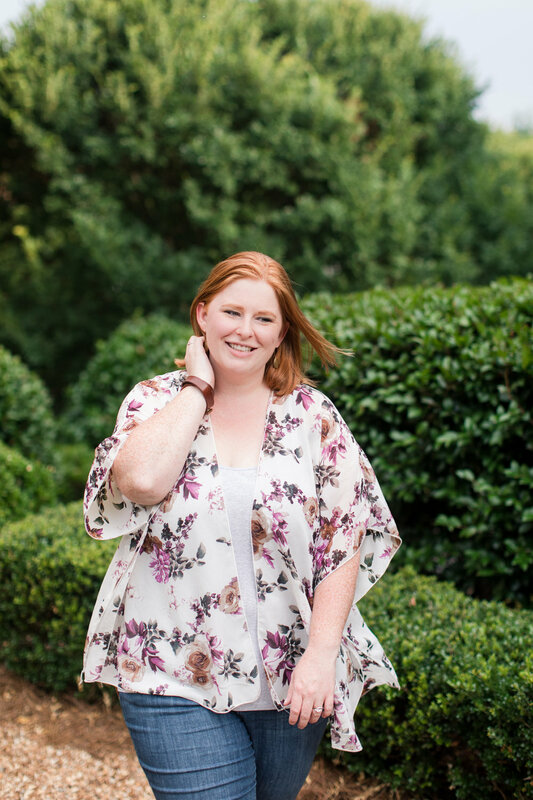 The kimono in this photo from my Stitch Fix box earlier this summer. LOVE IT! This "Work hard, stay humble" shirt from Forging Fabulous! It is sooo soft and fits great! P. S. It's 20% off right now! What are you watching/reading/making/ or wearing this week? Comment below and let me know.